Hank, August 17 Pet of the Week! : Ohhhhh how I wish I could have another dog! You are here: Home / Pet Corner / Hank, August 17 Pet of the Week! Hank, August 17 Pet of the Week! Ohhhhh how I wish I could have another dog! Oh…just look at this face! Hey-o, Hank! Want a loyal friend? 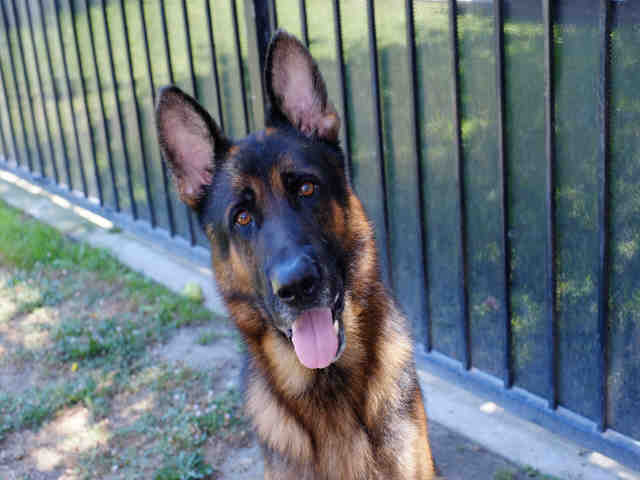 Look no further than this dashing 5-year-old German shepherd! Hank knows sit and down, but what he really loves to do is play fetch. We’ve got lots of dog parks and a great dog beach for Hank to indulge his passion at! Meet Hank at Animal Care Services on the shelter side of the P.D. Pitchford Animal Village, 7700 E. Spring St., Long Beach, (562) 570-PETS. Ask for ID#A594602. Credit: Courtesy of the P.D. Pitchford Animal Village.